Paul Hankar built this house for the painter Ciamberlani in 1897. The Art Nouveau structure seems to jump out from the surroundings at you. The reason? The magnificent grafitti panels on the facade. It looks at once like a toy and a cake. It looks like it should belong in a fairy tale. Check out the horseshoe shaped windows. Unfortunately you cannot check out the inside of the building as it is a private property. You will have to be satisfied with taking photographs. How popular is Hotel Ciamberlani Asbl? People normally club together Russisch-orthodoxe Kerk Van Sint-job and La Cambre Abbey while planning their visit to Hotel Ciamberlani Asbl. Very nice secession building, or art nouveau how they call it here. Magnifique ! 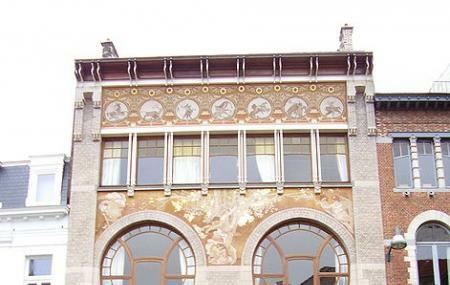 À voir absolument pour les amoureux de l'art nouveau. Edificio del arquitecto Paul Hankar. En él también colaboró el artista italiano Alberto Cimberlani que cubrió de excelentes pinturas toda la fachada. Visitable únicamente bajo reserva.